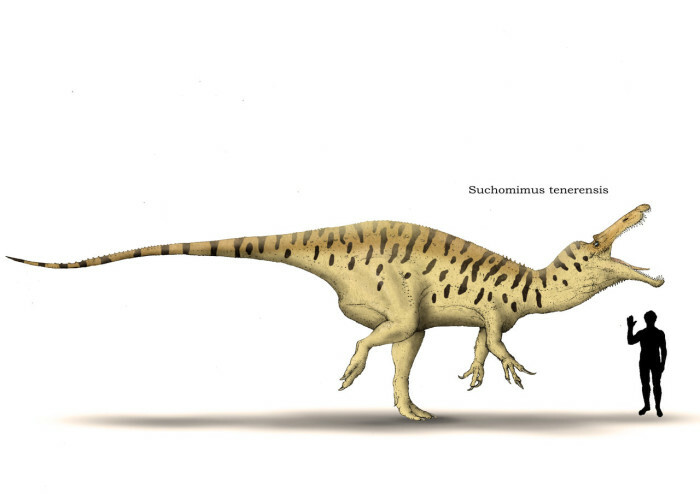 Suchomimus was discovered in Africa in 1997. Its name, “crocodile mimic,” refers to its long, toothy, distinctly crocodilian snout, which it probably used to snap fish out of the rivers and streams of the then-lush northern Sahara region of Africa. This dinosaur’s relatively long arms, which it may have dipped into the water to spear passing fish, are another clue that Suchomimus subsisted on an aquatic diet. 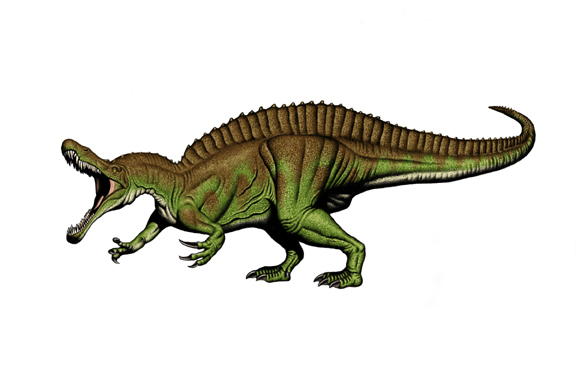 Classified as a “spinosaur,” Suchomimus was similar to a few other large theropods of the middle Cretaceous period, including (you guessed it) the gigantic Spinosaurus, probably the largest carnivorous dinosaur that ever lived, as well as slightly smaller predators like Carcharodontosaurus and the amusingly named Irritator. Because only a single, possibly juvenile fossil of Suchomimus has been found, it’s not clear what size this dinosaur actually attained. Some paleontologists believe Suchomimus, when fully grown, may have reached lengths of over 40 feet and weights of over 6 tons, putting it in the same class as Tyrannosaurus Rex (which lived tens of millions of years later). 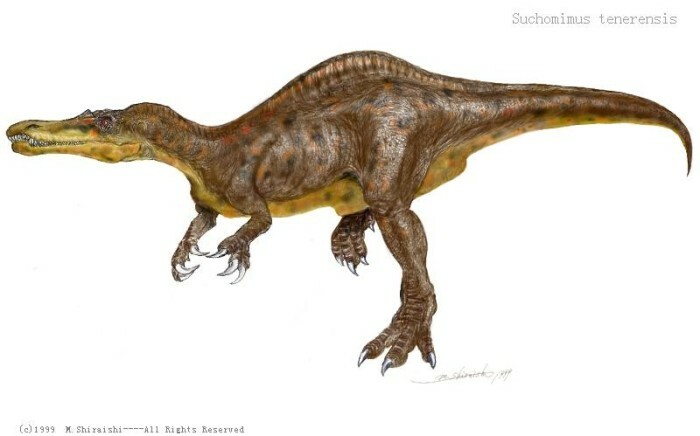 Suchomimus has been placed among the spinosaurids, a group of large predator-scavengers with jaws adapted for hunting fish and with less heavily built skulls when compared to other similarly-sized theropods, like the tyrannosaurids. The teeth were adapted for grasping rather than slicing and the roof of the mouth was more solid, allowing the spinosaurids to resist twisting forces exerted by prey. The rest of the body was not particularly adapted to the water. Apart from the back ridge, Suchomimus was very similar to the spinosaurid Baryonyx which also had strong forelimbs and a huge sickle-curved claw on its “thumb”. And, as with Baryonyx, the claw was the first fossil part to be noticed by palaeontologists. The holotype and only known individual of Suchomimus was considerably larger than that of Baryonyx, but the ages of the two individuals are not known. It may also be a synonym of Cristatusaurus.